The countdown to leaving Colorado continues. It’s becoming a lonnngggg countdown! We enjoyed a peaceful day yesterday. We went to Barnes and Noble and got Davey the next Geronimo Stilton book in the Kingdom of Fantasy series. We are working into books that are not strictly picture books (although Davey still loves them too). Geronimo Stilton is proving to be a lot of fun because it is very interactive (some puzzles, games etc), and it also has illustrations. I highly recommend it. 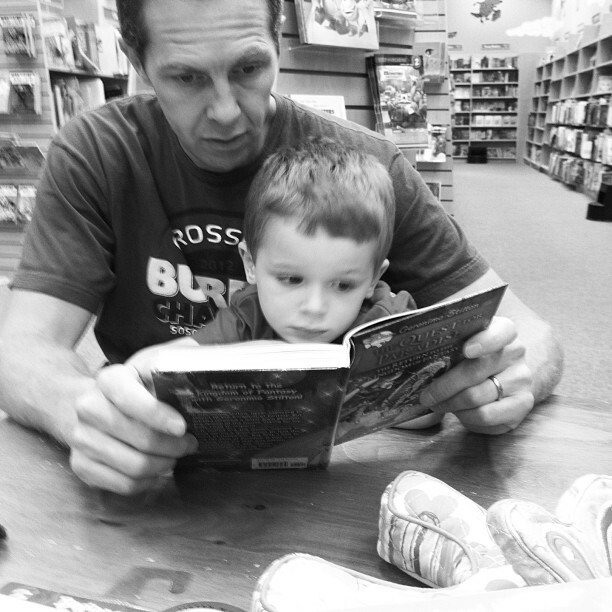 David and Davey settled in for a bit and read together at the bookstore. I’ve also decided that I need a new hobby. Ok maybe not, but I’ve decided that I want to learn to sew. I kinda learned a little once upon a time about 20 years ago. My mother-in-law helped me make some summer dresses. It was fun. Probably more fun because she very much knew what she was doing and was a great guide. But thankfully there is also so much online help now (since she is in Oklahoma and I will be in Washington!). I want to try some craftsy classes to help me learn. I also bought some fabric (I almost said yarn out of habit) at Fancy Tiger and a pajama pant pattern. It’s supposed to be a good pattern for beginners. First I need to get out my sewing machine (once I get to Ellensburg). I probably should have it cleaned. I think this is something that should be done periodically, and I think I have had it cleaned maybe once in the 20 years I have had it. It’s not like it’s been greatly used. I can thread it (or I used to be able to. May need google to help me find an old Pfaff manual) and have had the opportunity to sew some very very basic things in the past. Squares and such. There are words that scare me a little with sewing (kind of like lace used to scare me in knitting). “Bias” and “on the bias”. Interfacing is another one. I’m open to advice! However, between craftsy and the kajillion sources available on the internet, I think I can do this. That’s the plan. In the meantime I have some knitting to do. This entry was posted in Family and tagged beginning sewing, Geronimo Stilton, Kingdom of Fantasy by cpeezers. Bookmark the permalink. I enjoyed seeing your vacay pictures and your family at play! I wish I knew how to sew too but since you already have a sewing machine I think you are ahead me :))) Looking forward to seeing what you sew up ~ and have a safe journey home. I can sew ;-), yet another thing we need to get together for! !